The Black Bat #1: Brand of the Black Bat and Murder Calls the Black Bat [Sanctum Books; $14.95] kicks off a new series of pulp magazine reprints staring a hero who was very nearly Batman before Batman. As explained in a historical essay by Will Murray, the Black Bat debuted in Black Book Detective less than thirty days after Batman appeared in Detective Comics #27. Coincidental though they were, the similarities between the two characters almost led to a lawsuit between DC Comics and Thrilling. Instead, the two publishers worked out a truce. Batman wouldn’t appear in pulp magazines and the Black Bat wouldn’t appear in comic books. 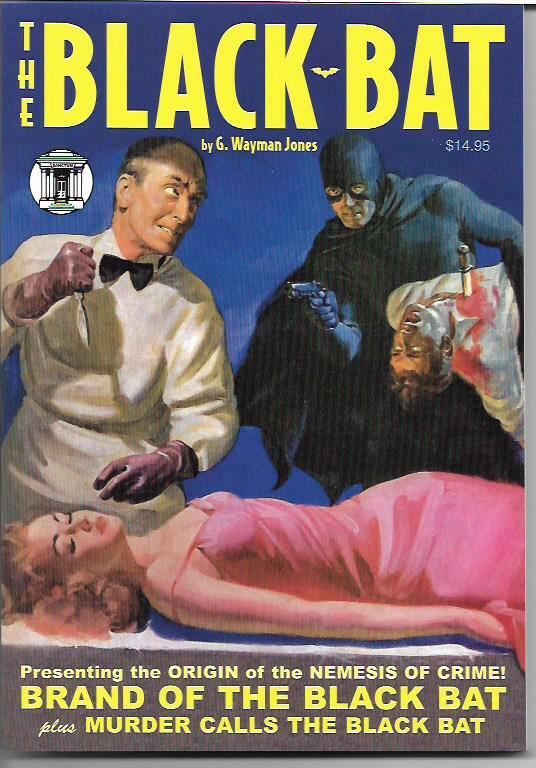 Created by prolific pulp writer Norman Daniels (writing as G. Wyman Jones) and with considerable input from Thrilling’s editor-in-chief Leo Margulies, the Black Bat is the darkly-costumed persona of Tony Quinn, a former district attorney blinded in a courtroom attack. If you’re thinking Two-Face, well, there’s a good chance that Batman villain was inspired by Quinn. Unlike Harvey Dent, the terribly- scarred Quinn doesn’t go insane and turn to crime. Carol, a beautiful stranger, takes Quinn to a mysterious surgeon. Quinn’s sight is more than restored. He can now see in the dark as easily as in light. Before long, he becomes the Black Bat and, with Carol, a reformed con man named Silk, and a brawler named Butch, he declares war on criminals like those who blinded him. Indeed, his first case is to bring those very criminals to justice. This book reprints the first two Black Bat novels with the original illustrations by Harry Parkhurst. They are exciting adventures in the general style of The Shadow and The Whisperer, also published by Sanctum Books. Quinn is an admirable hero who inspires loyalty from his team. In public, to protect his other identity, he keeps up the pretense that he is sightless. Even so, Police Commissioner Warner suspects his friend Quinn is the Black Bat (but chooses not to pursue his suspicions). Detective McGarth, a bulldog of a cop, also suspects the truth, though he keeps failing to prove Quinn is the Black Bat. The ongoing duel between McGarth and Quinn adds some welcome humor to these sometimes grim thrillers. By the way, Thrilling didn’t entirely keep up its part of the deal. As “The Mask,” the Black Bat began appearing in Exciting Comics. The first of these comics stories, adapted by Raymond Thayer from Brand of the Black Bat, is also included in this book. Sanctum Books always delivers great bang for your bucks. I’m a big fan of their books and recommend them to all readers interested in pulp adventure heroes. 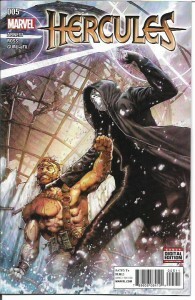 The Black Bat #1: Brand of the Black Bat and Murder Calls the Black Bat is my pick of the week. I’ve always liked Marvel’s Hercules. It’s why I chose him to be the “strong man” of the Champions in the 1970s. He was bold and brash and a whole lot of fun. However, in Hercules #1-6 [$3.99 each], we see a different Hercules. Writer Dan Abnett gives us a hero weary with being the super-hero frat boy of the Marvel Universe, bone-tired of being laughed at for his many peccadilloes. He’s on the wagon as part of his desire to clean up his act and restore his reputation. It’s moving to see a hero who is at once so powerful and yet also so vulnerable. I like this more sober Hercules. Unfortunately, this Hercules also has to contend with the Uprising Storm: new gods for today’s world who want to sweep away the myths of the path. To oppose them. Hercules gathers together an unlikely alliance of friends and former foes. Yet even their combined might may not insure victory. The new gods are both mighty and ruthless. Even with his knowledge of modern times and technology, Hercules is in for the battle of his life. All six issues of this mini-series have been collected in softcover as Hercules: Still Going Strong [$17.99]. I caution you that this collection ends on something of a cliffhanger. The story continues in Civil War II: Gods of War [$15.99], which will be released this November. I recommend the first book and I’m looking forward to the second. 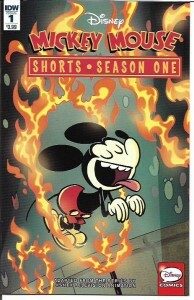 Mickey Mouse Shorts: Season One #1 and #2 [IDW; $3.99] surprised me in a good way. I hadn’t seen any episodes of the Disney animated television series, so I didn’t do what to expect. Disney Mickey Mouse executive producer Paul Rudish is as much a fan of Disney comics as anyone. The show tries to bring us the sillier side of the courageous, feisty, resourceful Mickey while maintaining his adventurous side. The result is some of the wildest Mickey cartoons since his black-and-white days and these comics adaptations of the cartoons are just as wild. In just the first issue of the comics series, we see Mickey trying to win a dog show, commuting in Japan, dealing with Donald Duck’s comical foot injury, attending a soccer match and striving to have a romantic evening with Minnie. In the second issue, in addition to stories involving pandas, a fish and a double date with Donald and Daisy, we get “Potatoland,” a hilarious road trip tale that speaks to how much Mickey’s (and Donald’s) friends mean to them. It’s my favorite of these “shorts” stories to date and one I think worthy of, at least, a nomination in next year’s awards. Pulp adventure, god-like heroes and villains, the most famous mouse of all. The variety available to today’s readers is nothing short of staggering. What a great time to be a fan. That’s all for this column. I’ll be back next week with something a little different. I think you’ll enjoy it.